Heroes of the Storm is still evolving in its technical alpha; the latest announcement is that of a new leveling system. Players will not only have a player level, but individual levels for each hero. Increasing your hero level will unlock core gameplay features such as heroic abilities and talents, as well as cosmetic skins and mount variants. Also announced is the introduction of artifacts, but their exact use is yet unclear. “We’ll have much more information to share on that in the coming days” promises the blog post. 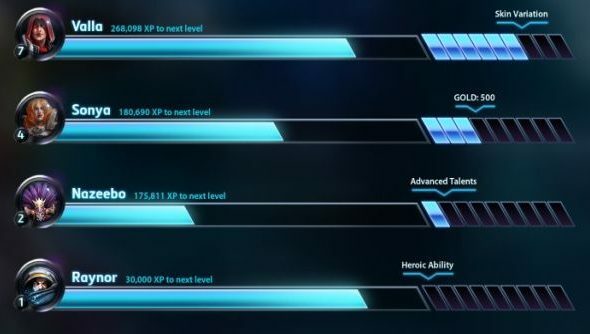 Previously, players in Heroes of the Storm would have a single ‘player level’ that represented their experience. Increasing this would unlock various features, as well as bountiful amounts of gold to use in the shop. 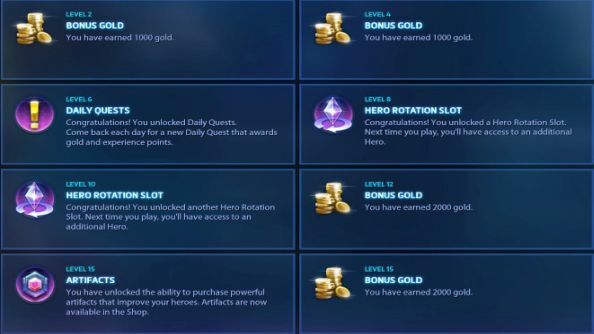 Heroes themselves did have their own progression system in the form of quests, but it was fairly limited. The first couple of unlocks will actually affect your heroes performance during a game. Having access to a heroes second Heroic Ability and all of their talents enables them to become much more versatile. However by introducing them slowly, it helps players not feel overwhelmed on their first game with a new hero. The rest are purely cosmetic: hero portraits, skins and mount variations. Reach the latter levels for a particular hero and you’ll unlock “Master” versions, which include features such as golden borders and themes. The player level system has also seen some changes too. The reward structure has been modified to give more regular bounties of gold, as well as a new reward called Artifacts. The blurb from the screenshot above says that they’re items you can purchase from the shop that “improve your heroes”, but apart from that there’s nothing else known. Whether it’s something similar to League of Legends and their Rune system, or something completely different cooked up by Blizzard, we’ll find out “in the coming days”. Other changes include gold rewards upon wins and losses: 40 gold and 10 gold respectively. And you’ll be able to complete Daily Quests in both cooperative and versus modes alike, but they’ve been scaled back to 200 gold each due to the aforementioned win/loss reward.